In Solyndra's Wake, Solar Company Sees Bright Spot SoloPower is on its way to receiving a loan of $197 million from the Energy Department — the same kind given to now-bankrupt Solyndra. But SoloPower has to meet a number of benchmarks before tapping into the fund, and one step toward that is the opening of a new plant in Oregon on Thursday. SoloPower is betting it will succeed where others have failed with a $197 million loan from the Department of Energy. A small solar power company hopes to become a winner in a market littered with losers. San Jose, Calif.-based SoloPower is opening a $60 million manufacturing facility in Portland, Ore., Thursday as it works toward receiving a major government loan — like the one given to now-bankrupt Solyndra. SoloPower thinks it has a strategy to succeed where Solyndra failed. SoloPower makes a niche product in a highly competitive market. 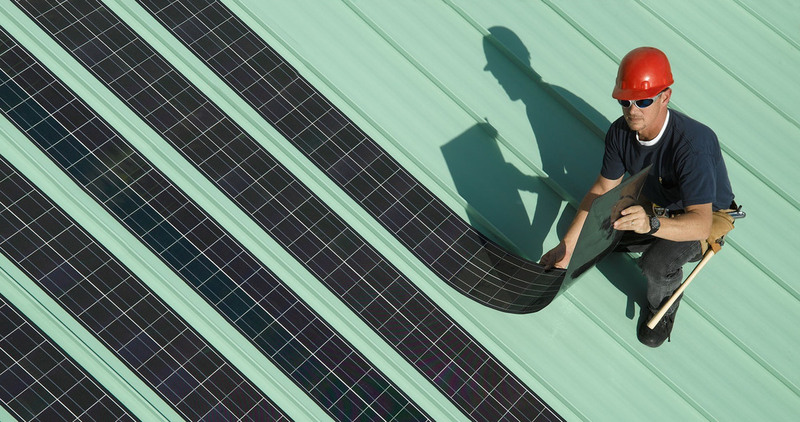 It's a lightweight and flexible solar panel, uniquely designed for commercial and industrial rooftops that can't bear the weight of the older, heavy traditional modules, says CEO Tim Harris. "Customers really like our product," he says. "They like the fact that we understand how to design it for the lowest cost of installation." SoloPower has to get its Portland plant up and running, and meet other undisclosed benchmarks before it can tap into a Department of Energy loan of $197 million. If all goes as planned, that will happen within a year. Some industry analysts are skeptical, though, including Matt Feinstein of Boston-based Lux Research. He says SoloPower depends on prices that are too premium for its product. "I don't believe it's a sound strategy without a significant gain in performance, and right now, we don't think SoloPower has that performance advantage over the incumbents," Feinstein says. The incumbents Feinstein refers to are Chinese competitors. Another analyst, Shyam Mehta of GTM Research in New York, says SoloPower has a niche product, but he wonders about the size of its target market. "Their technology is completely unique, and the performance of their panels in the field is pretty much unknown at this point," he says. "So they have unproven, untested technology in terms of the power output." But SoloPower's CEO disputes that, saying demand for his product is high, particularly overseas, outstripping ability to make it. Still, SoloPower can't escape the comparisons with Solyndra. That company had potential, too, but industry post-mortems blame Solyndra's bankruptcy on its business model, including high production costs. Solyndra had more than $1 billion in private investment, but it also drew down half a billion dollars in federal loans without ever turning a profit. On the other hand, SoloPower has raised $219 million in private capital. One of its key investors, John Cavalier, co-managing partner of Hudson Clean Energy, says taxpayers should know that the company won't touch any federal money until it proves to be viable. "We have not done so to date, and we will not do so until there is every confidence that everyone will view the loan to SoloPower as a very prudent investment in the company," he says. With the loan, SoloPower gets at least two things: the capital to ramp up new lines of production — creating possibly 400 new jobs — and $197 million worth of more scrutiny.